As graduation season nears, many high school seniors debate on where they want to go to further their education and their future to have everlasting careers for years to come. For some, SUNY Cortland was the choice, as future students and their parents attended the 2019 SUNY Cortland open house Saturday, April 6. Altogether, over 2,000 people—including 900 new students—took their seats as SUNY Cortland President Erik Bitterbaum welcomed everyone to the university in his opening speech. Following Bitterbaum was Sophie Umansky, president of the Student Government Association (SGA) and a senior at Cortland. 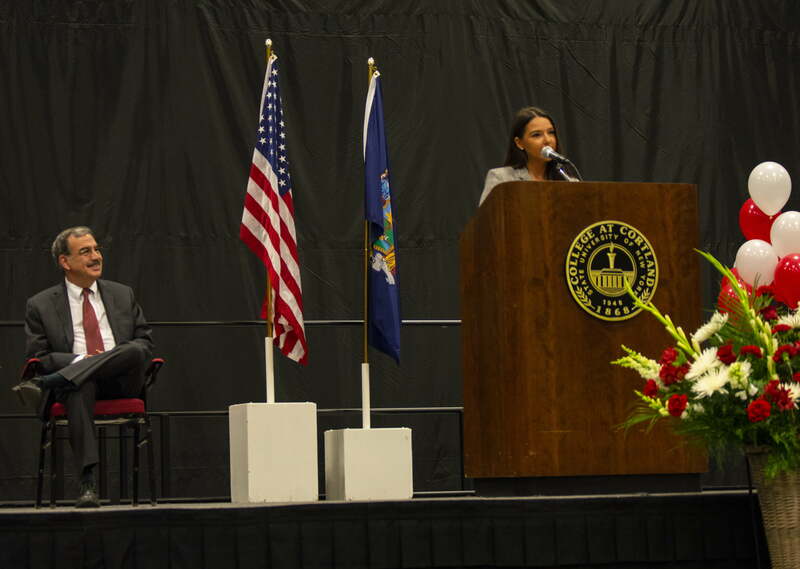 During her speech, Umansky urged the group of new Red Dragons to get involved on campus and not only make a difference but find a passion they can really pursue while attending Cortland. One of these incoming students was Grace Clark, a current resident of Long Island, who will be starting SUNY Cortland as a freshman in the upcoming fall semester. Clark plans on attending Cortland to pursue a career in Elementary School Education where she wants to be a teacher. Knowing that the college has “the best program”, she plans on making the leap from Long Island to Cortland in the fall. During the open house, a club fair was held in Corey Gymnasium to display all the clubs incoming students can join in the upcoming semester. Activities, sports, and organizations were all around the gym as excited students and parents browsed what club was just right. On campus, there are 75 clubs and organizations that anyone can join regardless of major. While many students applied to SUNY Cortland, many didn’t make the cut. In 2019, the amount of incoming freshman met the limit as just 1,250 out of 13,288 applicants were accepted to the college in 2018. President Bitterbaum gave future students some advice as they further their education at the college.